So after a day where my partner fought fascism and I did the laundry we decided to give Grillstock in the new Empire Bunker a try. After having a lot of actual American BBQ food 10 years ago during a stint working in Kansas City, Missouri, I was quite curious at a British interpretation. So as we came in I was hit by the sound; on a busy Saturday night the atmoshere was being fuelled by a lound soundtrack. Even though it was busy we were seated in 5 minutes, although it helps being a couple as we fit into a small window seat. Nope, did not choose the death by meat option. The system relies on customers making their choice from the menu and ordering at the bar. Unfortunatly the bar is an actual bar with a number of bar stools around it. If you want to order food you need to squeeze between the boozers and shout. I have a particular aversion to barflys; they are between me and beer and seem to begrudge the fact I have to shove past them to get served. It would be nice if Grillstock cleared this space a bit. There’s a good selection of beers, leaning towards the American style bottle craft ale. Sadly despite all the Americana there are no milkshakes. Still the staff were prompt and soon I was returning with a Pistonhead lager and diet coke. While we waited for our food I had a good look around. Like its neighbour Turtle Bay it has a very fake ‘stripped back’ look. As much as I moan about how ubiquitous hipster shabby chic is I quite like it. 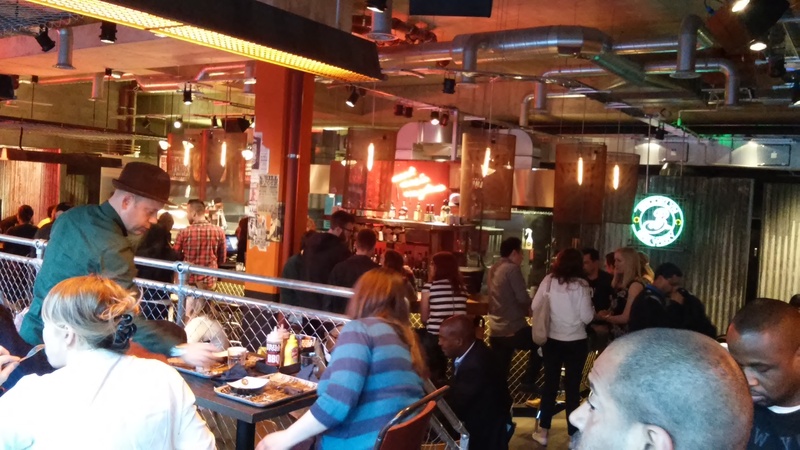 But Grillstock just looks like a chain restaurant playing at being down and dirty. While we waited I looked for wifi; I found a connection on my phone but it was locked and the waitress said it wasn’t yet available. This kinda shows that the restaurant is still bedding in. I went for the Smokestack Burger (my partner the half rack of ribs). They came with fresh coleslaw, interesing lime tinged pickles and fries. The fries looked nice with seasoning on them but were rather dry and needed support of the BBQ sauce and ketchup. 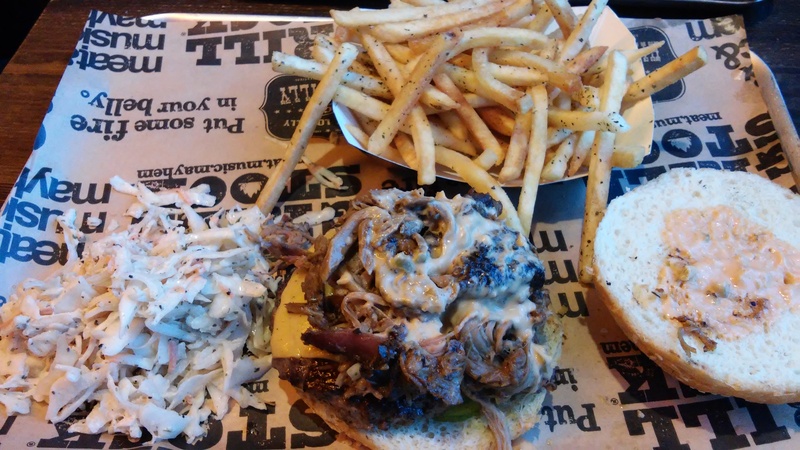 The burger had pulled pork on it. I’ve been off this for a couple of years after a food poisoning experience followed by a lousy pulled pork bap. However this was very nice, full of flavour and tender. The burger was nice; plain but well made. Typical ‘American’ plastic cheese and a simple white bun; no brioche bread here. Overall the food was nice but not the flavourfest I found in the states. I think next time I’ll try the chilli burger. Dessert? Only in liquid form. 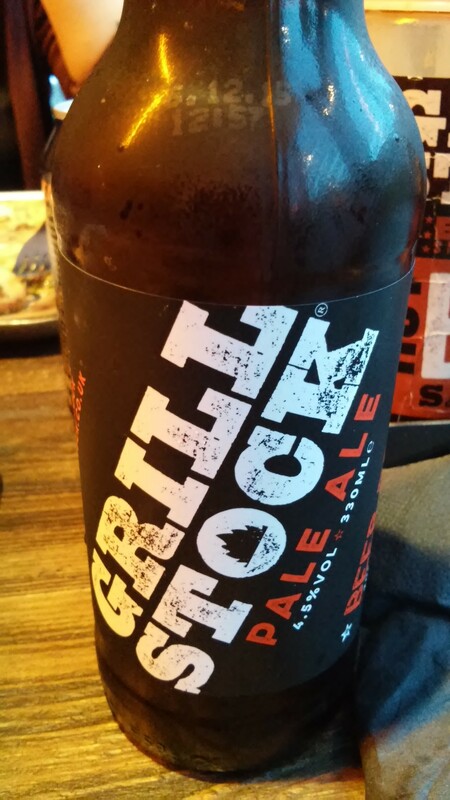 The highlight of the meal for me was Grillstock’s own Pale Ale, apparently brewed in Bristol. Three hop varieties means it has a good sharp edge to challenge food flavours but is not like being punched with a bag of hops (like the Brewdog IPA, also on the menu). I’ll have that again. 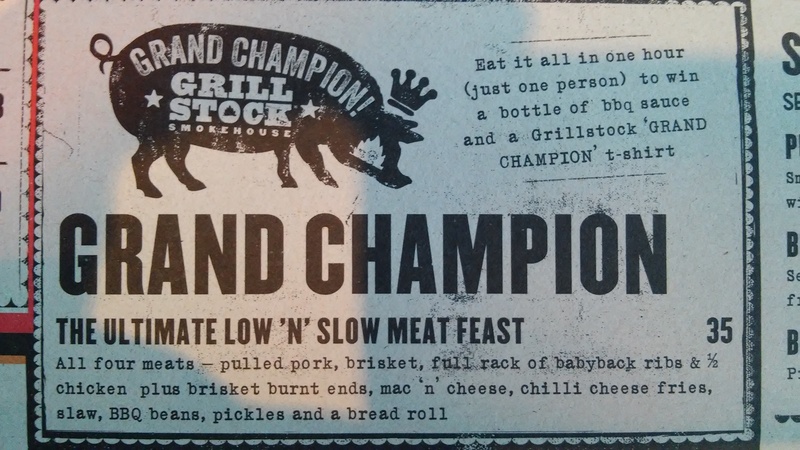 Overall I liked Grillstock but it’s not a place I think you *have* to try. It’s like our own TGI Friday substitute with more interesing food and better drinks. I’d like to try on a quieter night or maybe a lunch time. I think it will do well and fills a gap in the choice we have. 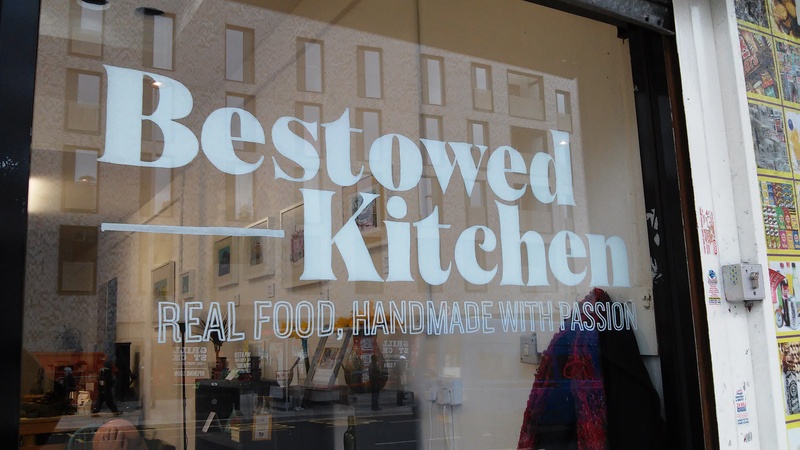 So I was catching up with some reading in the latest issue of East17 last week and there was an article about Bestowed Kitchen. Following a good review in the Walthamstow Life Facebook page I went along with my partner and her parents to the popup venue on Hoe Street. It was understandably busy on a Saturday lunchtime. Yet again we have shabby chic with the extra twist that most of the furniture has price tags. I felt like I was having a meal in a thrift shop. The counter seemed to be constructed from pallatte wood and there was art on the walls from local artists. 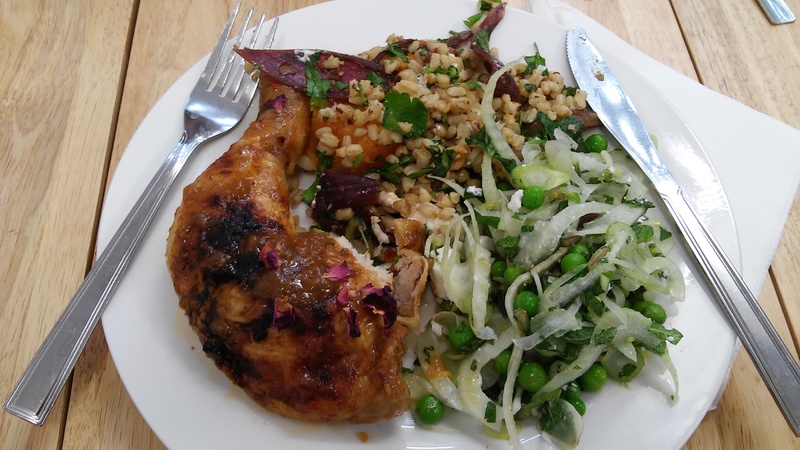 They specialise in nice salads with other food; we only saw the option of chicken but there were 5 different salads. They have hot drinks, soft drinks and a selection of ELB beers from Stratford. So the salad was very nice. The food style remninds me a lot of the Peyton & Byrne menu. 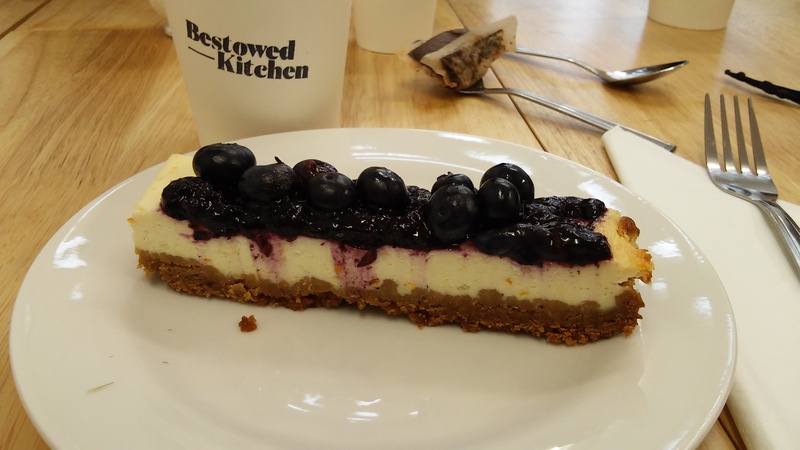 Sadly in the busy rush our drinks were forgotten so I had to remind them; with the cutlery at the ‘start’ of the counter I got the impression of foodies with little experience of the practicalities of running a cafe. Their web site details their outside catering, which I suspect their strength lies. 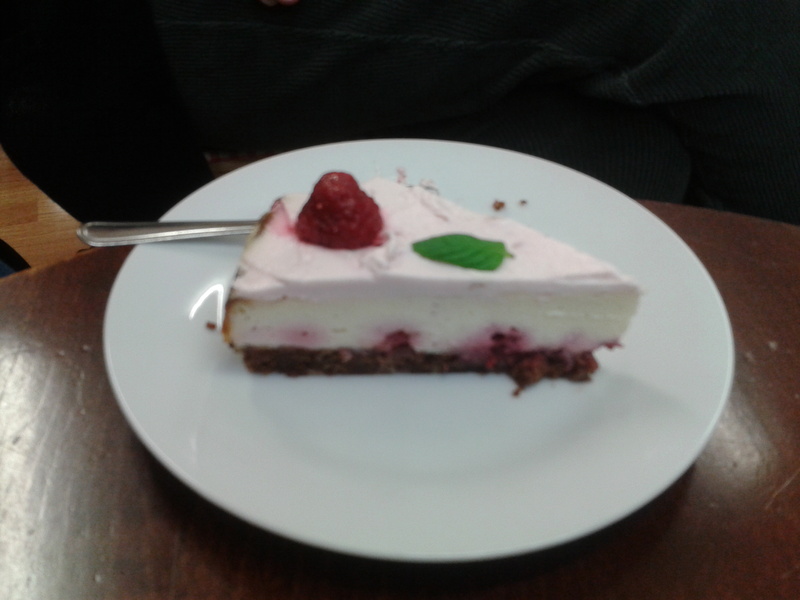 We finished off with desserts which were very nice. 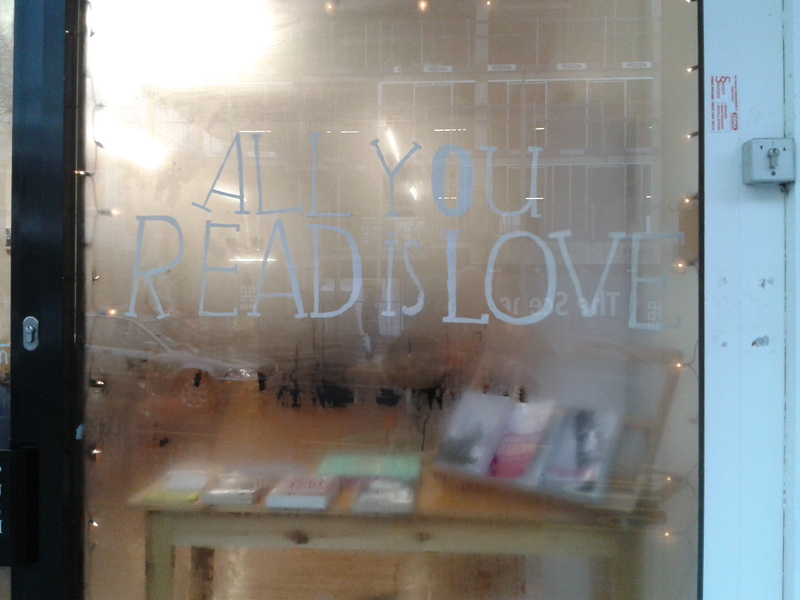 I’m glad we have had another successful popup in the council shop. There have been a number of successful projects there and I hope this is another local business given a boost. Another late write up. Complaints to the usual address please. 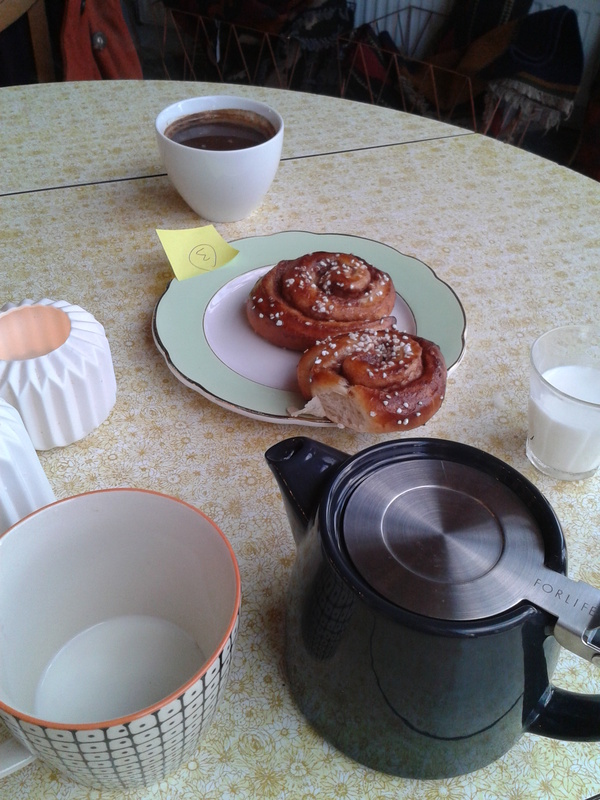 3 weeks ago we went in search of the new Nordic themed cafe/homeware shop Bygga Bo. We found it along Chingford road, just along from the Bell pub. ‘Found’ being the operative word; their premises have smoked glass windows like Cafe 56 and we just noticed the writing on the bottom of it with the name. The interior reminds me of many shops and reclamation yards in Islington; large industrial lamps on swing arms, retro candle pots. 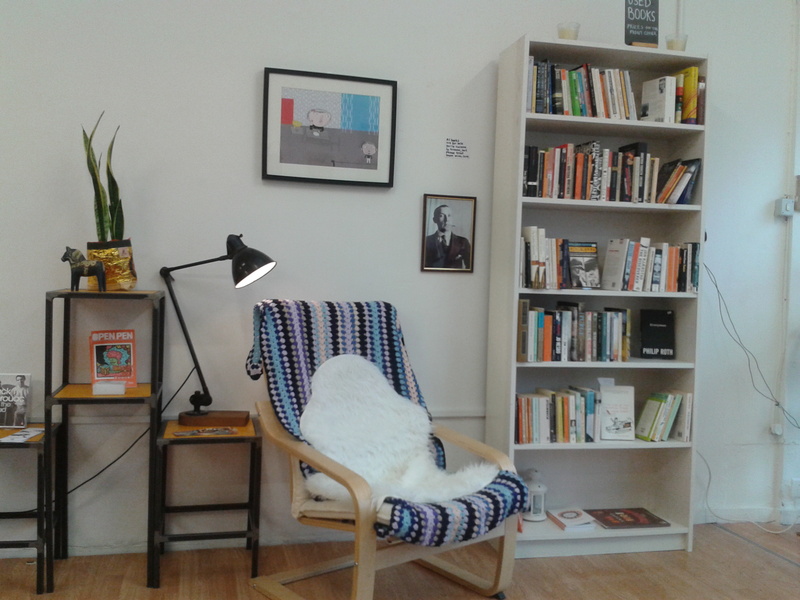 The mismatched furniture isn’t quite full on shabby chic, which frankly made for a nice change! So full marks for food. 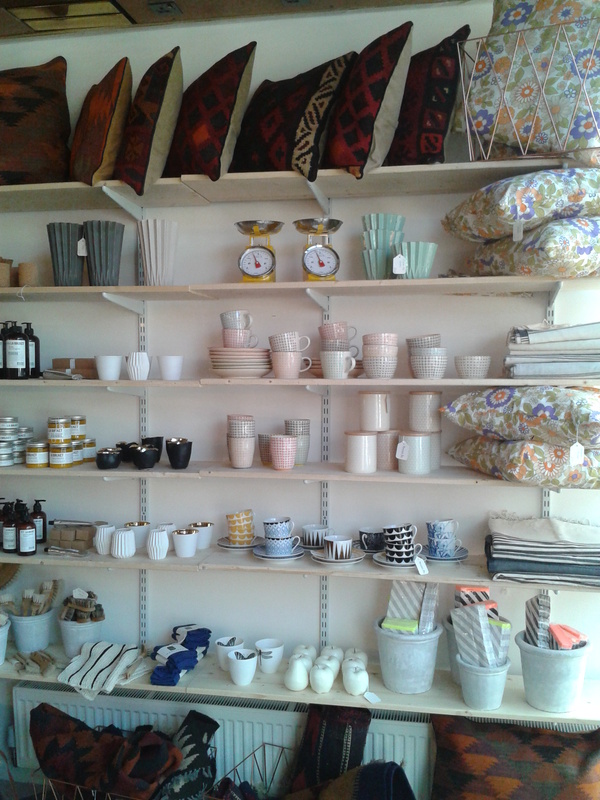 As a gift/interiors shop they have a nice selection. My partner bought an orange tea towl. They have a nice selection of goods. Hopefully they’ll cycle their wares often to bring people back to shop as well as eat. Frankly I highly applaud their avoiding the Village as a location; they are walkable from there by the ‘in crowd’ but as a ‘regular’ resident of the borough support for the non-trendy parts is much appreciated! It’s a nice alternative to your weekend cafe. Please do give it a try. 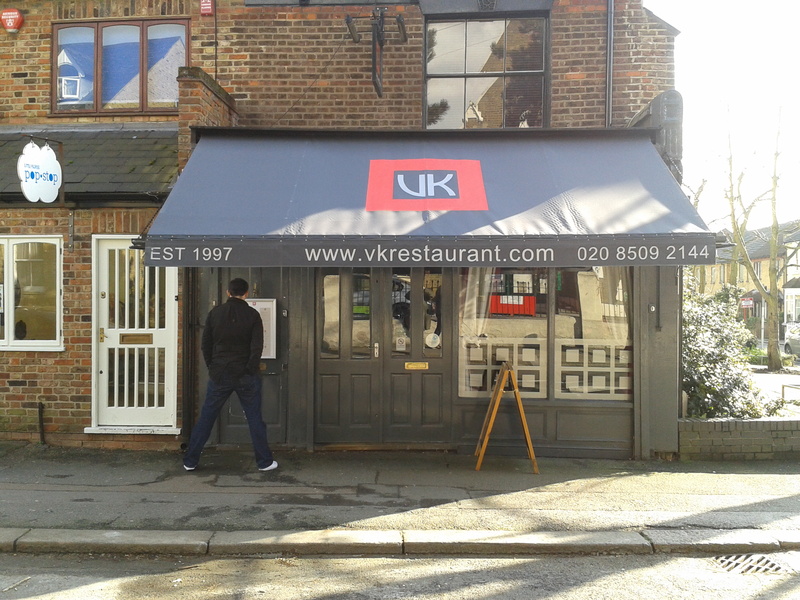 Many years ago the ‘VK’ was on Hoe street and we went there often. So it was nice to go in and give the new place a try.The décor is quite smart with very ‘restaurant’ furnishings. Velvety chairs. So no ‘Shabby Chic’ here! I went for the American breakfast; sausage, bacon slice, fried egg, maple syrup and 3 halves of pancake (why three halves? What happens to the fourth?). My partner had an egg on toast with chorizo option. Both were very nice but at £6 each this isn’t your cheap high street fry up. It was a lot quieter than the other eateries; I’d place it between cafe and Eat17 as an option. It has quite limited space but I think makes a nice alternative for a smaller party who haven’t booked Eat17 a week in advance! 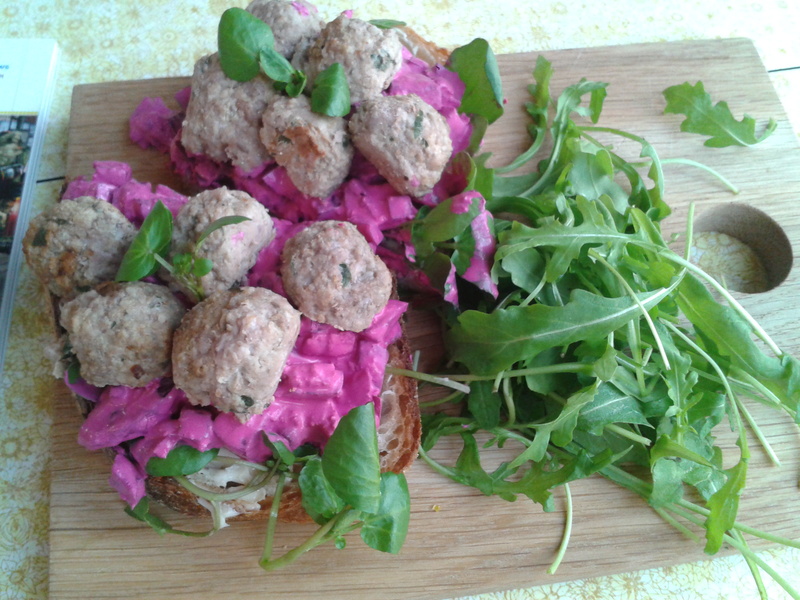 My partner and I usually have Sunday brunch in Daisy’s cafe on Hoe Street after visiting the farmers market. But that’s been shut for renovation for the past month. 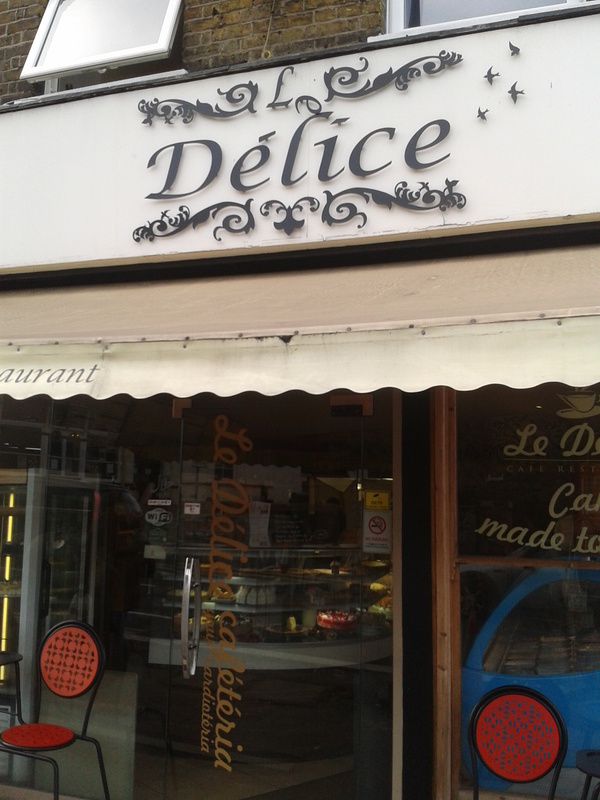 So 2 weeks ago we tried Delice a little further down. And we returned there today! I’ve walked past many times but assumed it was more of a cake shop with all the cake references. While they seem to be a bakery it is also a cafe. 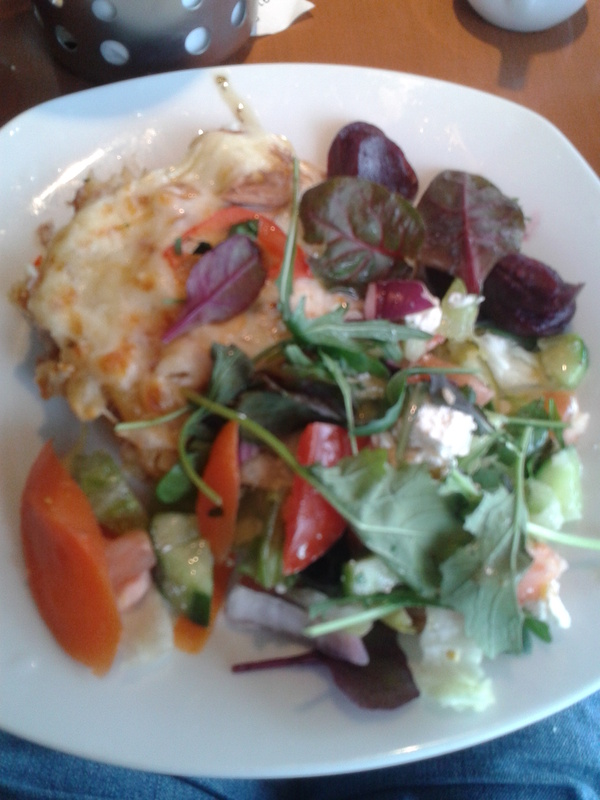 The first time I went I had a tuna pasta bake with salad and this time I had a large chicken burrito. The salad bot times was really nice and each meal was good at just $4.50. My partner has taken a shine to their Spanish omlette. It was quiet today but a bit busy last time. They have a lot of seating and the both times we had our food served really quickly. They have a board full of lovely sounding sweets including waffles. Anyone remember when Eat 17 was a waffle restaurant? Anyway after Daisy’s is back in service I think we may change our allegiance. Delice has a wide array of sandwich options plus different hot lunches. Worth that extra 2 minutes walk down Hoe Street in my opinion. 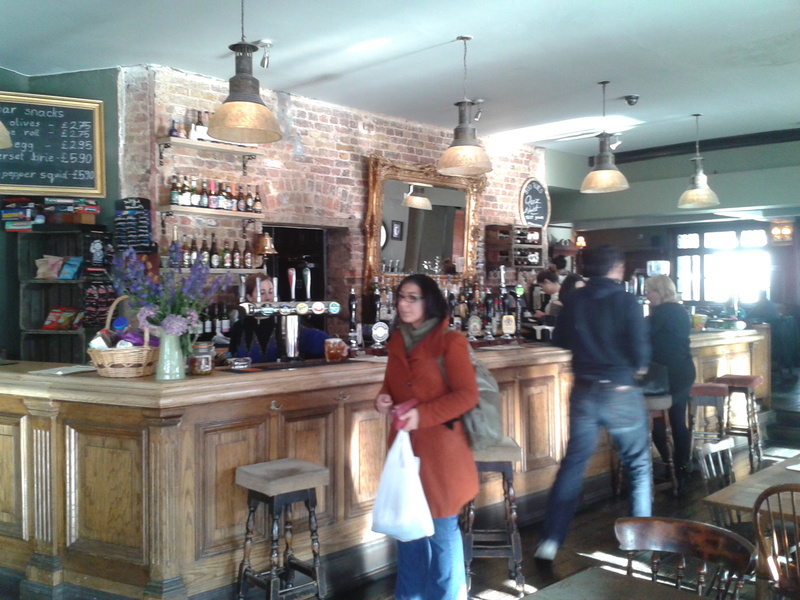 So a week late in a way as we went to the revamped Bell pub after visiting the William Morris Gallery last weekend. I never went to the old pub before the revamp and it’s over a year since that happened. While I live just 15 minutes walk away in Higham Hill it’s just not on my route to anywhere. Even when I’m going to the big post sorting office or Walthamstow Central I will avoid that corner and cut down Jewel Road (and if I really want a beer I can stop off in the Rose and Crown). But I’m glad we finally made the effort. 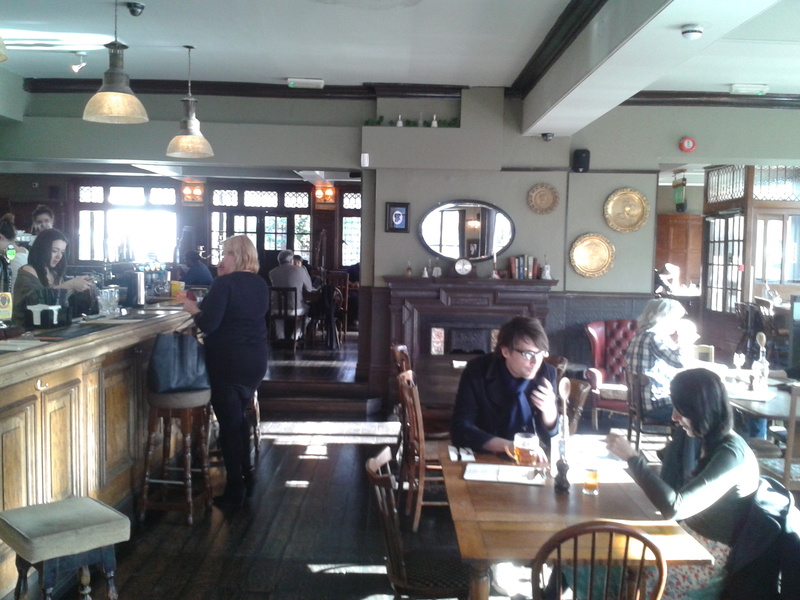 The pub is outfitted in the now typical ‘shabby chic’ (q.v. Chequers and Cafe 56). Lots of mirrors on the walls and mismatched chairs. A few sofas. Still, it has a lot of personality and I was very glad to see families and couples enjoying themselves there. 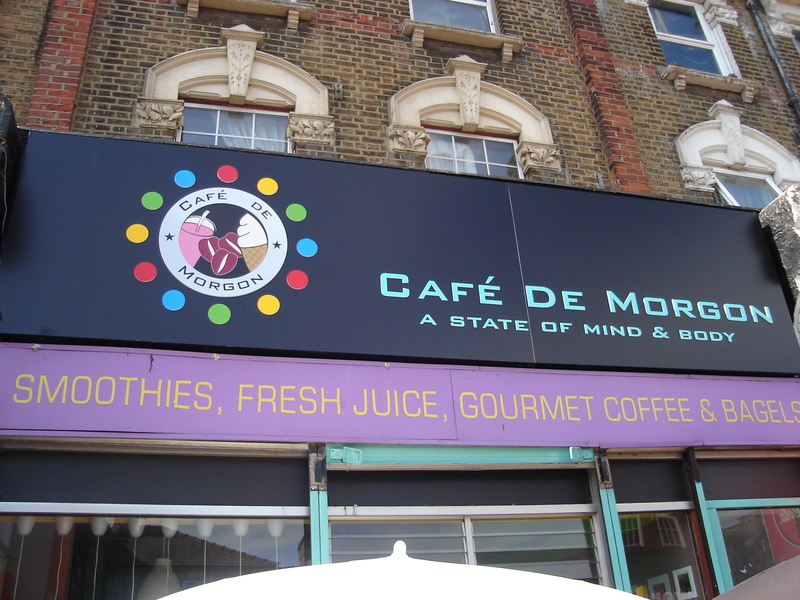 When we went there was a selection of Motown playing, which gets Weird Walthamstow’s seal of approval. 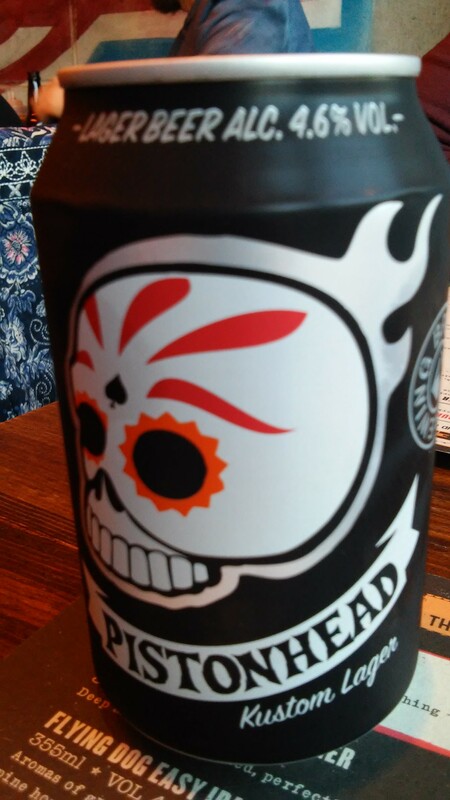 There was a selection of ales so I had a Hotback Summer Lightening. I was asked if I’d like a jug or straight glass, which shows focus to the main product! My partner isn’t a drinker so had a coffee which apparently rated ‘okay’. Their menu is typical top end pub grub; not cheap but no doubt nice. 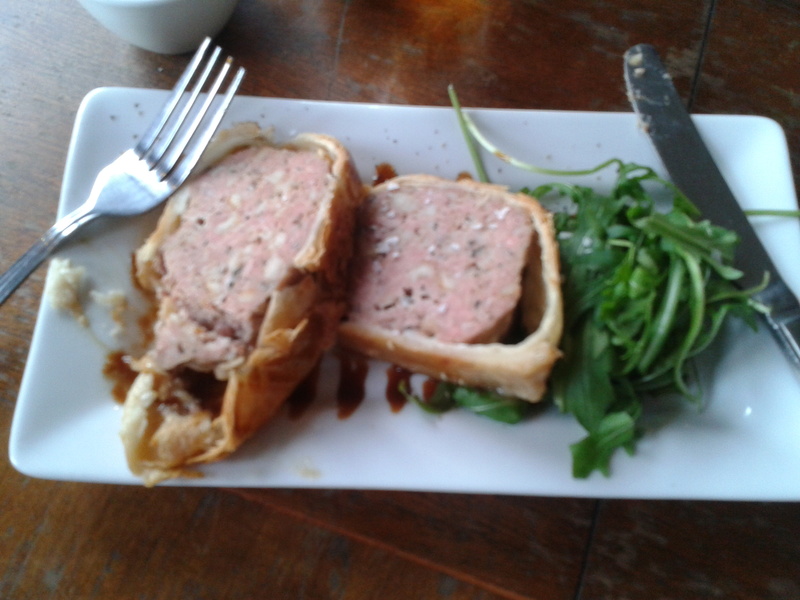 I was still peckish after wandering an exhibition so decided to try the bar snack menu and have a £2.75 sausage roll. See how nice that looks? 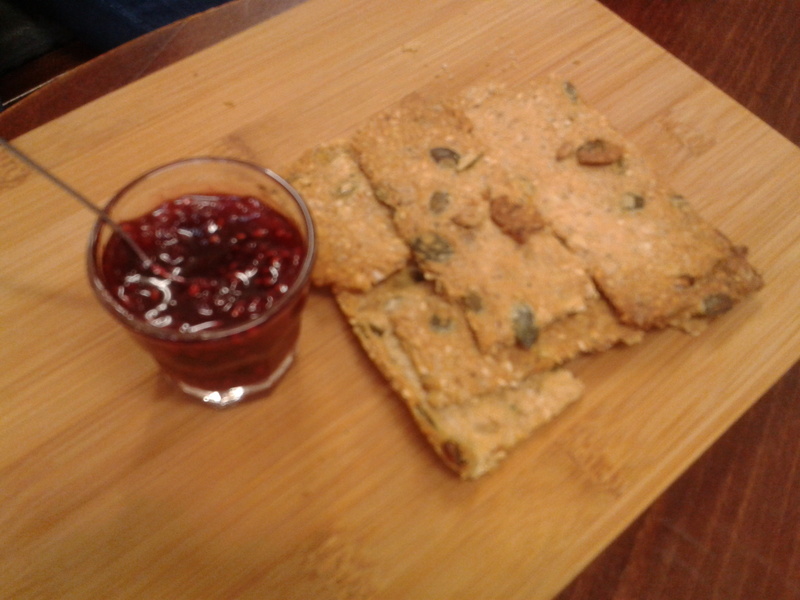 Tasted lovely too. Sadly they don’t seem to have free wifi – 21st Centuary, guys! The toilets seemed clean and well maintained. It’s always nice to avoid ‘dive’ pubs. It’s a bit out of my way but I will be making that effort to visit again soon. It’s worth it. This place opened up a few of years ago under the name ‘Euphoria’. 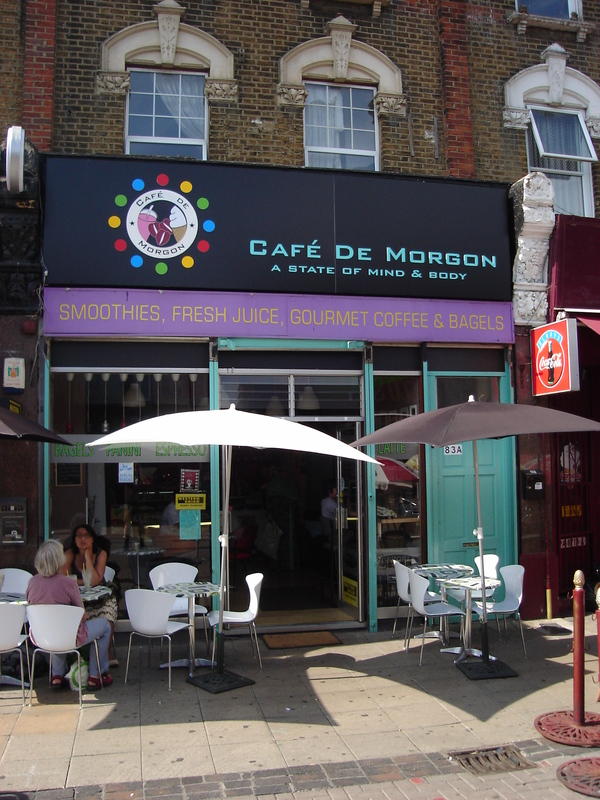 It specialises in doing a range of fruit smoothies. These are really nice, and the perfect choice for a hot day. They also do filled bagels which make for a light lunch. I’m not a coffee drinker but they are very proud of their own custom blends and I’ve been told they are very good. 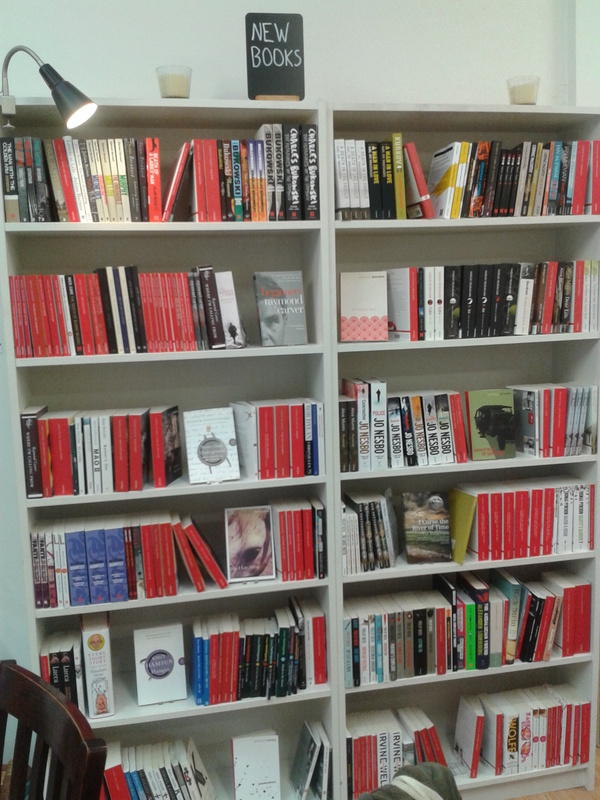 They recently had a rebrand and shop facelift so it’s looking nice! It's a nice place to go on a sunny day.